The SmartThings hub, also made by CentraLite. Engadget today published results of their research of the top 20 Smart Home systems and named SmartThings as it’s recommended pick. The news shouldn’t come as a surprise to anyone who uses Iris, but the real shock was that Wink was named runner-up. Sadly, Iris did not even get a mention. No system is perfect, but Samsung has chosen to open up the platform to allow anyone to develop new rules and apps to extend the functionality of the system. 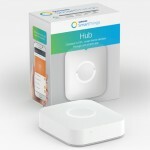 The Samsung SmartThings Hub is the most evolved among a number of well-rounded products already on the market. It’s competitively priced, is compatible with a wide range of third-party devices, and supports most of the major smart-home wireless protocols, including Bluetooth, Wi-Fi, ZigBee and Z-Wave. Since switching to SmartThings 6 months ago we honestly can concur with their finding. But don’t take our word for it, read the article and leave your comments below.